Fiscal zoning — explicitly considering fiscal health in zoning — has been debated by practitioners and implemented in various forms for decades. However, this often takes the form of overzoning for preferred fiscally positive uses or evaluating potential fiscal impacts only on a project-by-project basis. 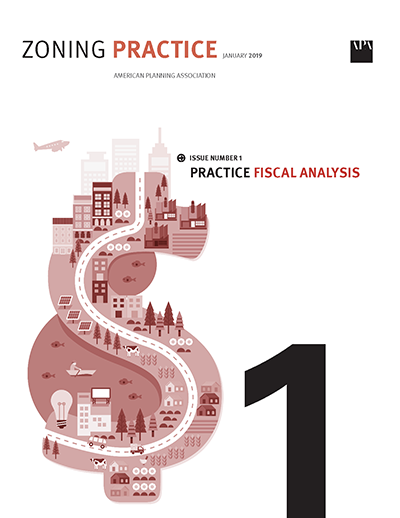 This edition of Zoning Practice explains the key factors that determine the fiscal impact of different land uses and development patterns and makes a case for a more holistic approach to planning and zoning for fiscal balance. Ranadip is a real estate development advisor dedicated to the creation of high-quality urban environments. As a Senior Vice President at SB Friedman Development Advisors, his practice area focuses on market and economic analysis, development impacts of transportation investments, and value capture financing of infrastructure. Ranadip has a Master’s degree in Urban and Regional Planning from the University of Illinois at Urbana-Champaign and a Bachelor’s in Architecture from Jadavpur University, India. He is a member of the American Planning Association, Urban Land Institute, and Lambda Alpha International, the honorary land economics society. As Senior Vice President of SB Friedman Development Advisors, Fran Lefor Rood, AICP offers customized advice grounded in her understanding of real estate markets and extensive experience in helping clients reach their development and community goals. Her ability to analyze various market scenarios and recommend strategic redevelopment options that work for both the public and private sectors has been key to informing policy and development decisions. Fran recently assisted Elevated Chicago in identifying strategies to preserve affordability and enhance community control in support of equitable transit-oriented development in Chicago. She has also drafted a housing policy and action plan to address housing challenges in Wauwatosa, Wisconsin. In addition, Fran has led numerous financial analyses to determine the need for and structure of public assistance for various clients, reviewing $875.4M in public assistance for $3.9B in project costs. Fran holds a Master of Urban Planning and Policy degree from the University of Illinois at Chicago and a Bachelor of Arts degree in Public Policy from the University of Chicago. She is a member of the American Planning Association, Illinois Housing Council, Lambda Alpha International-Ely Chapter and Illinois Tax Increment Association, and serves as a mentor as part of The Goldie Initiative.